65 Kgs Carbouy / 275 or 295 Kgs Polydrum / 1400 Kgs of IBC / 26000 Kgs of ISO Tank . Mail us for FACTORY sale price of HEDP. Storage for ten months in room shady and dry place. Safety Protection: Acidity, Avoid contact with eye and skin, once contacted, flush with water. Chemical Name : 1 Hydroxy ethylidene 1,1-diphosphonic Acid or HEDP 60% Synonyms : 1-Hydroxyethylidene-1,1- Diphosphonic Acid. At high temperature of 250 Deg C HEDP also resulting good corrosion and antiscaling effect. It's good resistance towards High and Low pH value makes it unique and better than that of other organophosphoric acids (salt). HEDP also resulting high chlorine oxidation tolerance properties. used as peroxide stabilizer and dye-fixing agent; In non-cyanide electroplating. 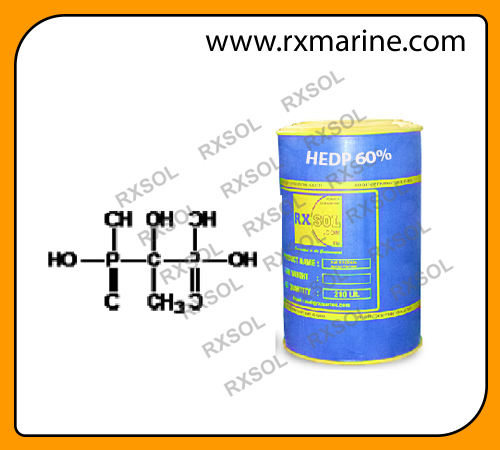 The primary raw materials used to manufacture HEDP are acetic anhydride and either phosphorus acid or phosphorus Trichloride. The phosphorus trichloride is converted to phosphorus acid within the reaction vessel, and then reacts with the acetic anhydride. HEDP is used as a strong Chelating Agent for Metal Ions like Ca, Mg & Fe in water Treatment, Textile, Sugar Processing, Dye, Soaps & Detergents.